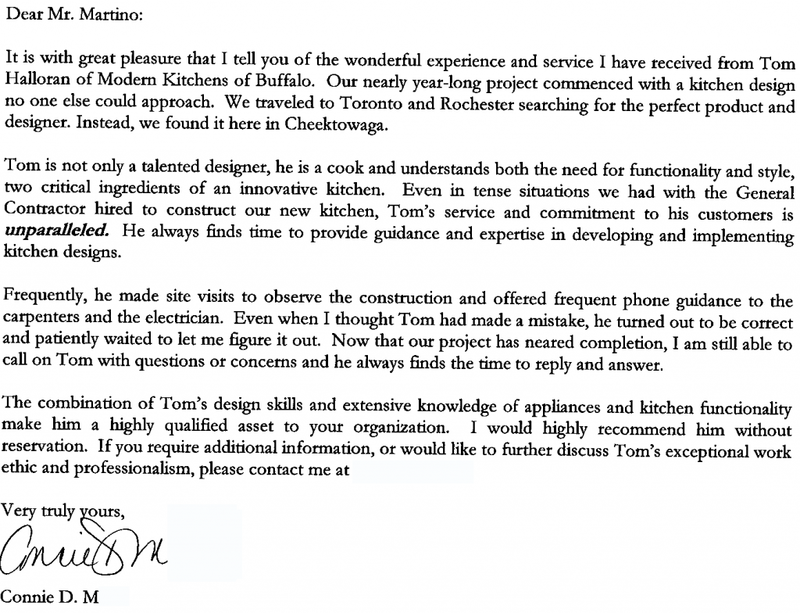 I am writing to let you know what a pleasure it was dealing with Tom Halloran from the Buffalo division of Modern Kitchens. Although Tom and I never met personally (an unorthodox relationship, one might say…), he was so highly recommended to me by my builder, himself a man of great integrity, that I felt totally secure in working “long distance.” I was not disappointed. Tom guided me with good taste and precision,questioning design elements when he felt it necessary and knowing when to yield when appropriate. Despite our geographical distance, his availability and attentiveness was never lacking. Communication was always clear between us, my builder, carpenters and decorator. The measurements were exact, the installation smooth and the finished product is beautiful. I plan to enjoy my Brookhaven kitchen for many, many years to come.